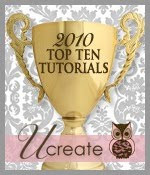 well i don't know if you saw, but my baby life quilt made it on U-Create's top ten list for 2010's most popular tutorials, ahem... this is my second year on that list. yeah, cause i'm cool like that. HA! kidding, i was floored when i got the email. mainly because this last year, i've backed off my main focus of being a craft blog, and going back to just being a blog of a gal who likes to sew, create, dabble in trying to decorate, spew off about stupid things that happen in my life and laugh at them. and well, thanks for sticking around. also thanks for supporting my shift in trying my hand at being a pattern seller. i really appreciate the love, the emails, the stories, on how my patterns and tutorials effect your daily lives, whether it be "i haven't sewn in years, and you inspired me to do so again!" to "i'm a beginner and your pattern was great to start off with! thank you!" i appreciate them. a lot. sometimes i still dabble with stopping this whole thing. but i know i would miss it, and i would still do what i do so might as well write about it right? and when you think about it, i'm just a mom writing from her lap top in bed in her pjs, after she helps her kids do homework, help them clean their bathrooms, take them to scouts, help clean little bottoms, wash away sad or angry tears of the day, and yeah even clean up throw up when they don't feel good... and lets not forget i'm also the wife to my best friend that makes me laugh so hard i spew diet dr pepper out my nose, and who takes my "issues" in stride... but mainly remember i'm a real person, with a lot of ups and downs, just like everyone else, and i'm grateful for the lovely comments, the lovely emails, the wonderful friendships, and the awesome opportunities this blogging thing brings. i'm super excited to start sharing some of the "opened doors" with all of you starting at the end of this month. thank you so much for reading, because without you, i wouldn't still be here. edited! holy smokes it's been a while and i'd not checked it out. but check out the flicker group! lots of you posting them there!!! thank you!!! Congratulations on make the top 10 (again!) and rightfully so. 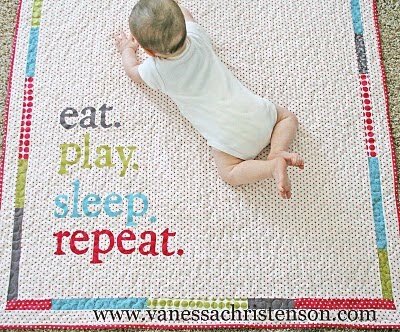 That quilt is amazing and makes me want to have a baby just so I can have a quilt like that. I think anyone that blogs knows that we basically blog about our good points. We're not saying our lives are perfect and our kids are always shiny and smiling, but we're just sharing the times that we actually got it right. And when we don't get it right and we feel like all is wrong and it's one of those times we happen to put those feelings into a post, it's nice to have the virtual hugs from our readers. But back to that quilt. I mean seriously... Where is my husband? Congratulations! That is an amazing quilt. You most certainly deserve all the accolades you receive. Congrats! Oh, and crafts or not, I love coming back for your witty sense of humor most of all. and thank YOU for sharing a part of your life with us. You are inspiring in so many ways. Don't stop please! You are a daily stop of inspiration on my wondering of the internet! and congratulations! Congrats. You deserve it. Thanks for writing this blog. I don't comment often but I always read your posts. Happy 2011! Congratulations! But I am not surprised at all! First of all, congratulations!! Secondly, oh my goodness ... this is the perfect quilt for me to make for baby of unknown gender for friends across the country that are having the second for which I haven't finished the first quilt for!! You ROCK!!! Thank you!! going now to hunt down said award winning tutorial and/or pattern :) Love ya! I hearted this quilt for reals and was not shocked that it made the cut. ahh i love you girlie! Congrats V! Haven't been by for a while, glad you're still around, the new house looks AWESOME! So much room, you must be loving/hating getting it all done "V" style! Christine of This & That Creations! Congratulations! I.just.love.you. and your ideas too! You inspire me in so many ways. Thank you for being real. And for putting your family first. May you continue to be able to 'manage it all' so that our lives will still be blessed by you. PS I ordered from the shop and haven't received the email yet.... fabric balls and fabric bracelet. No rush.... just hoping I didn't miss it in Junk mail or something. Thank you! I did find the order in that other email. Sorry about that.... You are wonderful to reply so quickly! Have a wonderful day! Many Congrats. That's awesome. Okay I want this blanket. Its adorable, but I am sooooo not crafty. Do you make it and sell it as well? I did not see it in your shop. LOVE that quilt. Also, I am getting a new sewing machine for my birthday and I am wondering what machines other quilters are using and loving. Thoughts? Congratulations V! That award is exactly as it should be -- that quilt is AWESOME!!! Congratulations, I did see that your quilt was chosen. I found your blog right about the time that you posted that quilt. Enjoyed it ever since :) You make your blog what ever you need it to be. It's the only thing that makes it work. That's awesome! I love love the blanket. annie get a bernina, they are worth it. also no i do not sell my quilts, sorry ladies, i just make the patterns and then keep them, and i wish i could make a bazillion of them so i could give them to you guys but alas...no time! Congratulations! I found this quilt and your tutuorial couple months ago and made it, my very first quilt! Thanks to your easy to follow instructions, I now love doing it and am on my third quilt! You have amazing ideas, keep them coming! !